File Types: EPS, PSD, All Files; File Size: 1.22 MB; Layered: Yes; Vector: Yes. 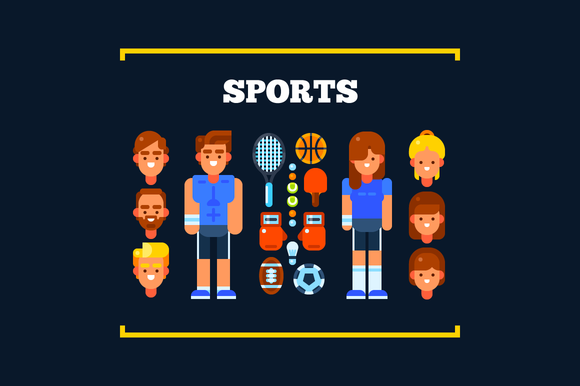 Sports people and sports stuff: tennis racquet, basketball ball, tennis ball, table tennis racket, boxing gloves, shuttlecocks, american football ball, football ball. - All in vector EPS, PSD, no transparencies . - Male and female versions. You can buy the full version http://crtv.mk/g0Pr7 (26(+1 bonus!) different professions and hairstyles for them. Male and female versions. 200+ different professional tools and items). Keywords: game, sportsman, player, sport, basketball, tennis, ball, soccer, boxing gloves, shuttlecocks, racket, male, female, vector, flat, icon, set, character, professional, people..
Best ddsign template, vectors, illustrations, video templates from creative professional designers with After Effect, PhotoShop, 3DS Max, Cinema 4D or InDesign. Full details of CreativeMarket Sports People and Sports Stuff 442550 for digital design and education. CreativeMarket Sports People and Sports Stuff 442550 desigen style information or anything related.